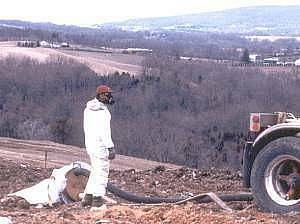 If the landfill is as safe as Waste Management would have you believe..
why the gas mask and body suit? 50 Feet Upward - According to WM - like a two story house. million dollars in potential revenues to Waste Management. 300 Acres Already Landfilled, 300 or more Acres Listed for Upper Pottsgrove Township - Where are the other 200 + Acres? 80,000 to 90,000 gallons toxic leachate PER DAY discharged into the Borough of Pottstown Sewer lines by 5,000 ft. main.